The price: Three tubes for $19.99 plus $8.95 for shipping and handling, bringing the total to $28.94. The late great Billy Mays just seemed so excited and sure about Mighty Mendit that it has to work. Right? 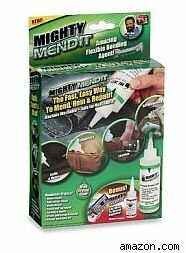 Mighty Mendit claims to be the miracle product for those who don't want to sew or need a sturdy repair in a hurry. There is some validity to the claims. A sneaker that split at a seam was ably repair by Mighty Mendit with barely a hint that anything was wrong with it. It didn't do so great making a hem on denim jeans. After more than two hours -- the amount of time the directions say a Mighty Mendit-repaired garment should be wearable -- the hem failed. It seems to prefer textures like leather and thinner fabrics. Mighty Mendit essentially is fabric glue, but seems to have an extra oomph, much like using epoxy. It smells very strong, like nail polish remover -- which makes sense since acetone is one of the ingredient. The product is highly flammable and is covered with warnings. For the direct ordering price of $28.94 for three tubes, it's simply overkill. Too much to invest for too much product. But if you scale it back for the $10 you could drop at As Seen on TV displays in pharmacies and discount stores, it could be worth a go if you have a few projects that might fit the bill. AOL has reviewed many 'As Seen on TV' products like Windshield Wonder, Mighty Mendit, Robo-Maid and the classic, The Clapper. To see the ratings for these and 30 other products click through this gallery.